SFHC members spent the day planting legumes, fruit trees and other crops in the new SFHC Centre garden today. They are building a living fence to keep out livestock and are building contour ridges to reduce soil erosion. They have received support from Seeds Knowledge Initiative, a like-minded organization based in South Africa that is helping SFHC build alliances across the region focused on food sovereignty, agroecology and equity. John Nzira from Ukuvuna in South Africa has provided training and support for permaculture design to be integrated into the SFHC Centre. 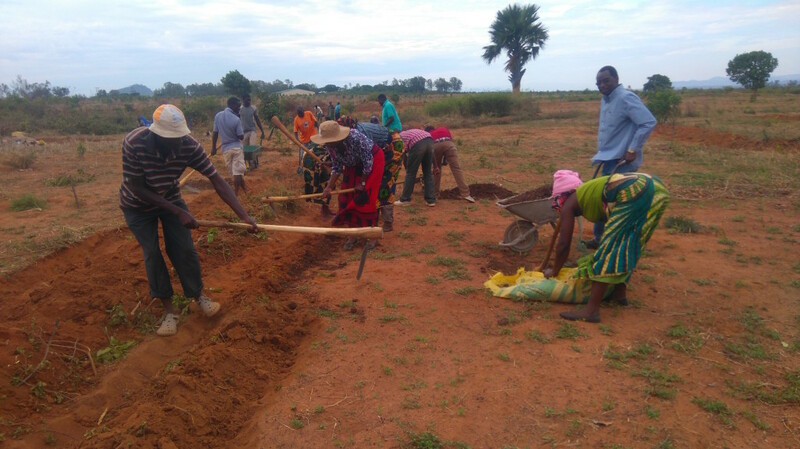 Pressings Moyo, Esther Lupafya, Esther Maona, Laifolo Dakishoni and other SFHC members build contour ridges and plant crops as part of their new permaculture-designed garden at the SFHC Centre. Timothy Wise, Director of the Research and Policy Program at the Global Development and Environment Institute at Tufts University, recently visited the MAFFA project site in Lobi. 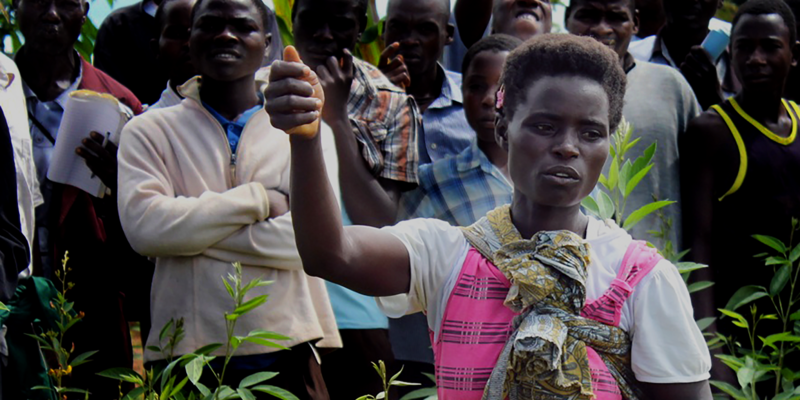 After his visit, Wise published an article with Food Tank highlighting our work while discussing the importance of seed sovereignty in Malawi and in Africa more broadly. 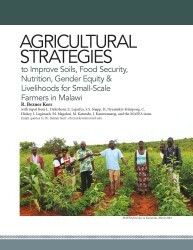 An article that is critical of the draft seed policy in Malawi has been published in the Malawi Nation newspaper by Blessings Chinsinga (at Chancellor College, University of Malawi) and Rachel Bezner Kerr: http://mwnation.com/draft-seed-policy-risks-marginalising-smallholder-farmers/ This article is an outcome of the discussions held during our recent policy workshop in May. Dr. Rachel Bezner Kerr is a professor at Cornell, collaborating researcher with SFHC as well as project director of MAFFA. We hope that this article adds to the growing voices of civil society who have expressed concern and discontent about this policy. We’ve had a busy few months on the MAFFA project! The MAFFA project team has been busy the last few months with a packed schedule of project activities! See below a few of the highlights! Thanks to all who attended and contributed to these important discussions, especially to the MAFFA farmers who shared their personal experiences! Special thanks also to Dr. Sekhar Nagothu and the Norweigan Institute of Bioeconomy Research (NIBIO) for their support of this workshop. Pests are an ongoing challenge for farmers and can have devastating impacts on yields. As part of our agroecological approach we do not promote the use of chemical pesticides. Instead we encourage farmers to experiment with a variety of strategies including intercropping and using repellent plants to control pests. This approach can be effective, but it can also take time to figure out the right approach or combination of approaches required. We received a lot of feedback from farmers on the MAFFA project who were having difficulties controlling a variety of pests, with a number of farmers having a particularly tough time controlling a beetle that was attacking their pigeon pea stand. Pigeon pea is a valuable crop both for improving soil fertility and as a nutritional addition to diets. To help farmers combat this beetle, among other pests, and to prevent them from becoming discouraged from growing this crop, we arranged for 6 MAFFA staff to attend Integrated Pest Management (IPM) training in August 2015. The MAFFA team attended a week-long training at the Grow Biointensive Agricultural Centre of Kenya (G-BIACK) and met with Entomologists at the International Centre of Insect Physiology and Ecology (ICIPE) in Nairobi. Our staff learned about many different agroecolocial approaches to combatting pests that could be tried with multiple pests and crops. 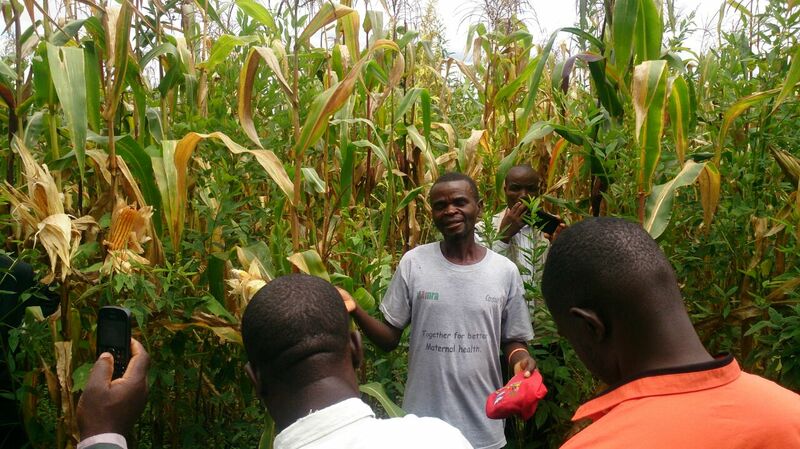 Upon returning to Malawi, field officers from both Lobi and Ekwendeni provided this training to our farmer promoters and set up experimentation plots in each area at the start of the 2015-2016 growing season to test the efficacy of the new approaches they learned about. Observations from these plots and interviews with the farmers who used these approaches are currently being done now that the growing season is coming to an end for most crops. The results from these experiments will be shared later this year! Most crops, aside from pigeon pea, have been harvested in both Ekwendeni and Lobi and yield assessments are currently underway. This year Malawi, like many countries in the region, experienced the worst drought in decades, which has devastated crops and left millions of smallholder farmers across the country with no food. The President declared a state of disaster for the entire country in April 2016, stating that there will be high need for food relief assistance through the duration of the 2016-2017 consumption year. The impacts of this drought are particularly disastrous as many farmers in Malawi also experienced low yields during the previous growing season due to drought and flooding. 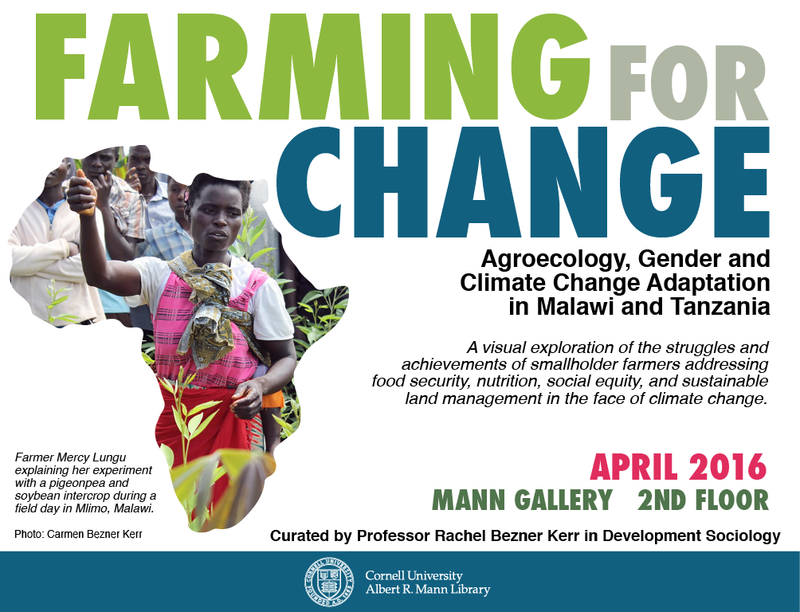 A photo and video exhibit, entitled Farming for Change which highlights some of SFHC’s earlier work alongside MAFFA will be on display at Cornell University’s Mann Library in Ithaca, New York, for the month of April. 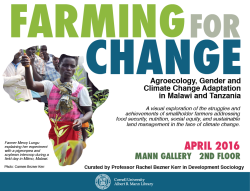 This exhibit chronicles some of the struggles and achievements of smallholder farming families in Malawi and Tanzania, in their efforts to improve food security, nutrition, social equity, and sustainable land management in the face of climate change. Climate change is one of many challenges that farmers need to take into consideration, alongside deep gender and other social inequalities, poverty, degraded soils, and limited state support. 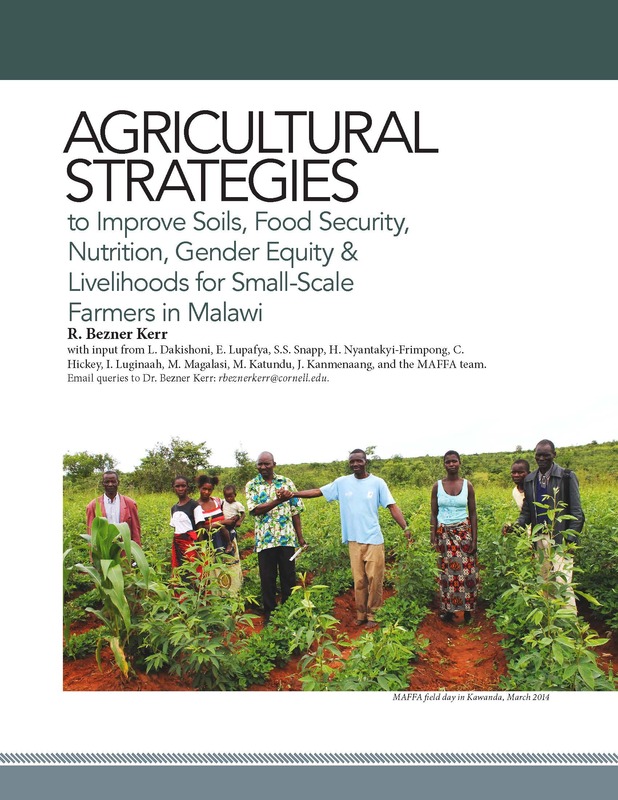 The photos and videos are drawn from over 15 years of participatory research carried out by Dr. Rachel Bezner Kerr, SFHC staff and farmers and other researchers. The annual field day was held in Jombo in the northern region this year. The turnout was high and people enjoying seeing the healthy crops and learning how people managed during this poor rainfall year. Those farmers who applied compost manure and planted a wider range of crops found themselves in a better food security situation than many of their neighbours, who had poor crop yields due to another year of poor rains. Here are two of the farmers who had their fields visited today. 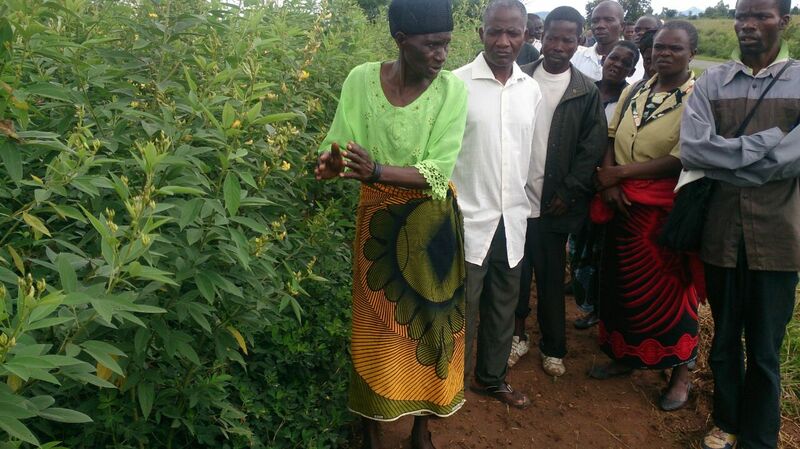 Milika Phiri at the Jombo field day, Ekwendeni region, explaining how she has grown such beautiful pigeonpea. Bonnex Nyasulu, who intercropped pigeonpea and groundnuts last year, incorporated the residue, and intercropped orange maize with pigeonpea this year. He applied compost manure twice to his field and his harvest will be plenty! Farmer Center is starting to take shape! SFHC is building a new Farmer Research and Training Center, just outside of Ekwendeni, to provide a site for farmer training, agroecological experimentation, recipe testing, demonstration gardens and research. Our long term vision is that this center will be a place where visitors can learn from and work with farmers – they will be able to see demonstration gardens of agroecological methods, attend trainings run by SFHC, try out new delicious recipes, and (eventually) stay in the new dormitories. 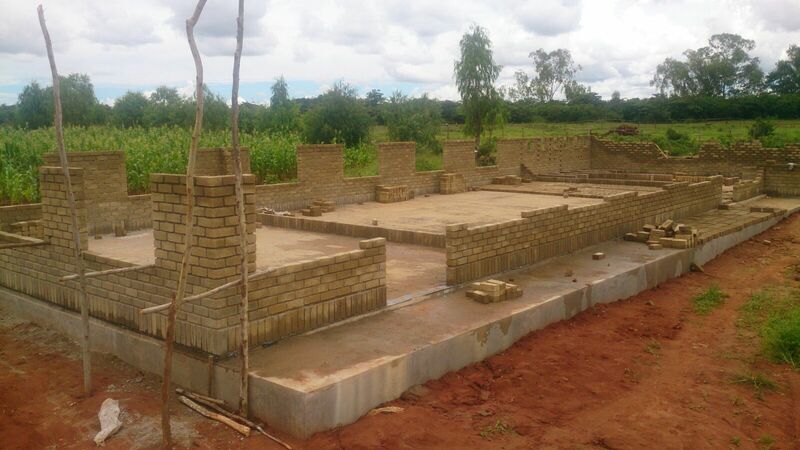 The Center is being constructed with funds from the Government of Canada, Global Affairs Canada, as part of the Malawi Farmer to Farmer Agroecology project. The first week of a new farmer-led curriculum, which integrates teaching on agroecology, nutrition, climate change and gender and social equity, was tested with 300 households in the Dedza District the first week of March. There was a lot of interest and enthusiasm for the material this first week of training. An additional 200 households will participate in this curriculum training in Mzimba District the third week of March. The curriculum, which was developed through a collaboration between SFHC, Cornell University, Michigan State University, University of Manitoba, Action Aid Tanzania and Chancellor College, University of Malawi, uses drama, dialogue and other teaching methods, and draws on the long-term methods used by SFHC. The curriculum is 2 weeks in length, and the second week of training will take place in April. The curriculum development was funded by the Atkinson Center for a Sustainable Future at Cornell University. It will also be tested in Tanzania with 400 households in 2016. We intend to make this curriculum available for public, not-for-profit use once we have revised it based on farmer feedback.